Making a difference, one tea cup at a time, the multicultural National Coalition of 100 Black Women San Francisco Chapter announces Sheryl Evans Davis, as keynote speaker and community leader awardees for its annual fundraiser, March 17, 2018. Thirteenth Annual Golden Girls Hats and Gloves Bridging the Generations' Tea"
The annual fundraiser benefits its workforce development program, Financial-literacy training, "My Sister's Keeper Conference" and more. The San Francisco Chapter of the National Coalition of 100 Black Women, among more than 50 affiliates nationwide, celebrates its "Thirteenth Annual Golden Girls Hats and Gloves Tea: 'Bridging the Generations' March 17, 2018. The chapter will host the tea with registration and silent auction at 11:30 a.m. The tea and program begin at 12:30 p.m. at the historic Fairmont Hotel, 950 Mason Street, San Francisco, CA 94108 on Saturday, March 17th. The San Francisco National Coalition of 100 Black Women, SFNCBW President, Karen Gilbert, SFNCBW Founder and President Emeritus, I Lee Murphy Reed, SF NCBW Tea Chairperson, Cynthia Moten have announced keynote speaker and the community leaders to be honored at this year's tea. Sheryl Evans Davis, the Executive Director of the San Francisco Human Rights Commission will be the keynote speaker. Prior to joining the Human Rights Commission, Davis was Executive Director of Collective Impact, a community-based organization in the Western Addition neighborhood of San Francisco. As Executive Director, she oversaw Mo'MAGIC, Magic Zone, and the Ella Hill Hutch Community Center. Mo'MAGIC, a collaborative of non-profit organizations, addresses challenges facing low-income children, youth and families in the areas of economic development, community health, and violence prevention. 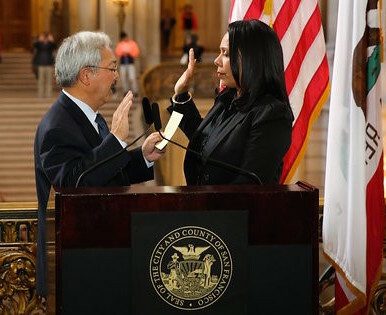 Davis holds a BA degree from San Francisco State University and Master's in Public Administration from the University of San Francisco. The 2018 Honorees are: Adrian Williams, Founder and Director of Village Project (Advocacy); Sherri Young, Founder & Executive Director, African American Shakespeare Company(Arts); Cheri Dove, Board of Directors, Friends of Faith (Community Service); Jamillah Moore, Ed.D., President of Canada Community College (Education); Carol H. Williams, CEO, Carol H. Williams Advertising Agency (Entrepreneur); LaVaughn Kellum-King, Commissioner, Southeast Community Facility (Health); Frances Luster, City and County of San Francisco of San Francisco Adult Probation Program (Golden Girl) and Pam Moore, KRON 4-Television News Journalist (Trail Blazer). Five Point, Owner and Developer of Mixed-Use, Master-Planned Communities (Corporate Award). "Our honorees represent the leadership that makes the fabric of American society great, "said President Karen Gilbert. President Emeritus I. Lee Murphy Reed's vision or honoring unsung heroes is a reminder that we should give honor where it is due as we stand on the shoulders of our ancestors. It's an inspiration to us all as the community joins us to celebrate the stories of these distinguished and accomplished women." The $150 tickets for the event are tax-deductible to the extent of the law and can be purchased by clicking http://bit.ly/2nG6ndH, calling 415 665-2524 or visiting www.ncbwsf.org. Sponsorships are available. Contact Cynthia Moten at 415 665-2524. Proceeds from the annual tea help fund the chapter's Workforce Development Training and Employment Program, a partnership with Covered California. The National Coalition of 100 Black Women San Francisco Chapter is an advocacy group dedicated to the empowerment, education and training of women for the total advancement of society. Visit www.ncbwsf.org for more information.